For a strictly limited time - The Log Cabin Ranch is discounting Winter Weddings by 50% for Weddings held during the months of June, July & August - 2017 + 2018. The cost to hold your Winter Wedding ceremony & reception at The Log Cabin Ranch during these months is at a discounted rate of 50%. *Applies to the first 70 guests ONLY. Note: A minimum spend of $2,625 applies to all weddings held during Jun, Jul & Aug 2017 + 2018. 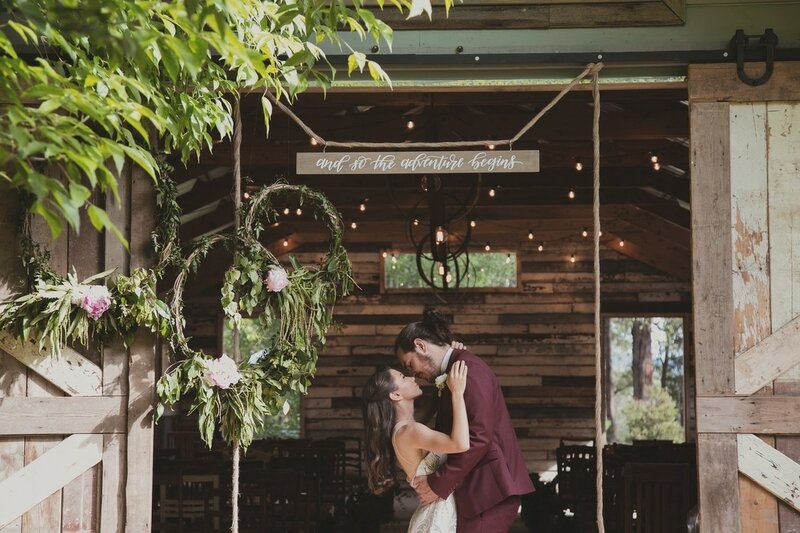 - Exclusive use of ‘The Stables’ for your wedding ceremony (A saving of $500!). - Accommodation for up to 70 guests included. No additional charge for accommodation. (Duration of stay is 5:30pm Fri through to 3:00pm Sunday). - Exclusive use of The Log Cabin Ranch property across 3 days. - Various Wedding Ceremony location options including ‘The Stables’, Lawn/Rotunda, ‘The Secret Garden’, Paddock Arbour, Elm Tree & Festoon Light Area (light hire fee applies). - Various Wedding Reception locations including The Barn, Alfresco BBQ Area, Lawn, Festoon Light Area (light hire fee applies). - Vintage ‘Bunkhouse' camp-style accommodation for up to 70 guests, including 3 ensuite rooms, country-style dining room and lounge area. - Toilet/Shower Facilities (including disabled facilities). - On-site car parking for your guests^. - Complementary photo opportunities throughout The Log Cabin Ranch property. - Use of inside + outside fireplaces – including large outdoor fire pit (subject to CFA restrictions). *Prices are inclusive of GST. Valid from 01/05/2017 to 31/12/2018 and are subject to change without notice. ^ Car parking during the Winter months of June-August may be limited due to rainfall & carpark conditions. Please enquire at time of booking. Discounted offer only valid for Weddings held at The Log Cabin Ranch from the 1st of June 2017 to the 31st of August 2017 and the 1st of June 2018 to the 31st of August 2018. Please fill-in the form to receive more information about holding your Winter Wedding celebration at The Log Cabin Ranch.